Photo courtesy of Annika Jorgensen. 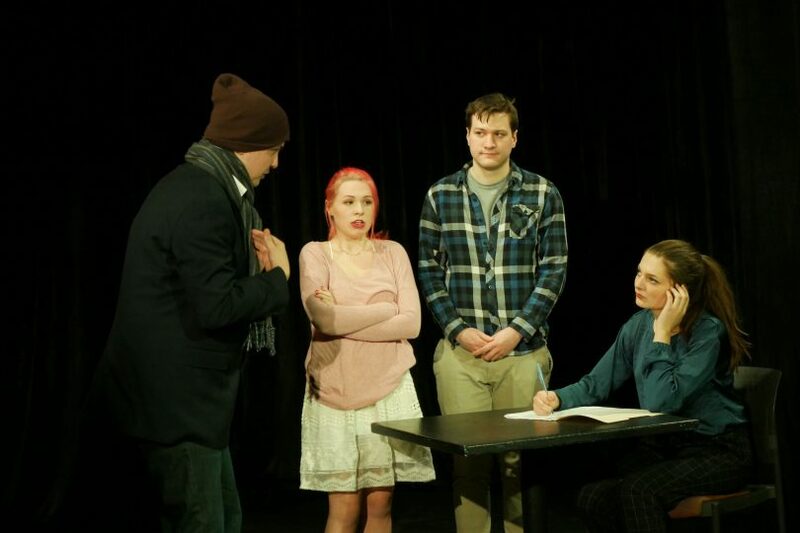 On the weekend of March 29, University Theatre hosted their annual “Student Written One Acts (SWOAs)” in the J.P. Adler Theater. The SWOAs, hand-picked by theatre department faculty from a playwriting seminar in the fall semester, are fully acted, produced, managed and directed by students each spring semester. The SWOAs are often one of my favorite offerings from University Theatre, highlighting the individual talents from a variety of students. The laissez-faire approach to teaching often brings some genuinely unique choices for shows, and with minimalist props and multi-use set pieces, the imagination of both the cast and audiences are paramount. The SWOAs are often one of my favorite offerings from University Theatre, highlighting the individual talents from a variety of students. While I will dive into each piece, overall, I have to give specific mention to the sound and lighting teams, who managed to weave each production deftly from one to the next. Seven shows, each averaging at around 10 minutes, were performed for this year’s production. The evening started with “Corona,” and its structure helped foreshadow the other six pieces: some lighthearted fun that turned dark, and fast. Centered around a retelling of the story of Dionysus and Ariadne, Cameron Brown and Olivia Quiñones play off each other’s characters all too well. The directing came to life during an extended scene of Dionysus portraying his life story through a series of “improvised scrapbook scenes,” expertly utilizing the background ensemble cast to recreate scenes from mythology. Perhaps the greatest fault of the piece is just how much it knows about mythology; there is a period of “catching up” in which the audience must be explained some of the rules and boundaries of this new, albeit deeply retold, version of ancient myth. Perhaps the exact contrast of “Corona,” “This is a True Story” is a meditative, well-crafted monologue focusing on the narrator’s stay at a psychiatric ward. Sarah Ford performing as the aptly named “Me” guides us through the ups and downs (and, quite literally, crappy moments) of the extended visit. Samantha Stewart’s directing shines in this piece, bringing the ward to life with only a few acting cubes, and the synchronicity of the ensemble cast speaking alongside Ford’s narration worked perfectly. “This is a True Story” stands out as one of the highlights of the evening. Flying back to a more comedic dimension, “Earth 52” invites the audience to an alternate universe version of Earth. An irreverent comedy about fitting in, “Earth 52” is bolstered by the on-stage charisma of the three-person cast: Steve Piccirelli, Diego Jorge and Ashley Sigerson. In theme with “Corona,” the most jarring aspect of the piece stems from the sudden transition of themes. It feels as if one minute we are joking about alien customs and galaxy guns, and the next, we’re learning some of the most important lessons on life. Perhaps, in the Earth where Sigerson’s character (just named ‘Alien’) comes from, this is a normal custom. Or, perhaps, it was a result of the intra-dimensional Jack Daniels drunk by the characters. Another stand-out piece, “Comedian of the Year” provides a preposterous amount of twists for such a short play. James Saracina’s writing creates a tour-de-force experience as we, quite literally, travel through a faux-timeline of an aspiring comedian’s life. Emma Johnson’s directing complemented the piece, managing to make the numerous scene changes in a clean, easy-to-follow way. The delivery and framework of the narrative is crafted expertly, and Chris Mancaruso (who performed the lead role on the Saturday shows) performed with the perfect amount of desperate charisma. “Paint the Surface” was delivered by the powerful acting of Patrick Graf as “Man” and Madison McGettigan as “Woman.” Centered around the ailing memories of a writer, the sense of urgency and fear in both actors was palpable, and one could feel the audience’s breath tightening towards the more tense scenes. The greatest setback for the piece, for me, was the structure of the narrative itself; while I had a general sense of the goings-on, I felt as if I missed some important piece of exposition. Perhaps this experience was intentional, as it helped the audience dive more into the mind of Graf’s “Man.” Regardless of the framework, the writing and delivery was emotionally driven enough for the setbacks to be ignored during the most intense moments. We learn the plot of “Go Fish” in pieces, and each time another card is put into play (metaphorically and literally), tension grows between the characters. Centering around an ill-fated manslaughter, the directing of the piece was one of the boldest of the evening; the characters, rarely actually looking at each other, manage to carry their chemistry with barely any contact. Perhaps this is what makes a singular moment of violence, choreographed by theater professor John Bellomo, so impactful: like the piece itself, it separates from the rest of the moments with confidence. Perhaps purposefully, the evening ended with a hilarious ensemble piece focused on one particularly awful day at a Wegman’s. With a multitude of interweaving character-based plots, each mixing and matching at the most perfectly inopportune times, specific accolades have to be given to the cast. Brandon Smith’s portrayal of how every cashier feels everyday had the audience cracking up with some of the simplest directions. Overall, “Keep the Change” offered an excellent complement to the evening. While the SWOAs only run for one weekend, I encourage all who may have missed this year’s shows to check them out the next academic year, and experience first-hand the student-made quality of our theatre department.